Figure 3.1. Alanine tRNA of yeast (tRNA1Ala): nucleotide sequence and secondary structure in the form of the "cloverleaf'. (R.W.Holley, J.Apgar, G.A.Everett, J.T.Madison, M.Marquisee, S.H.Merrill, J.R.Penswick & A.Zamir, Science 147, 1462-1465, 1965). Y, hU and T are pseudouridine, dihydrouridine and ribothymidine, respectively (see Fig, 3.2), I is inosine (see Fig. 3.3), and m*G, m22G and m*I are methylated guanosine and inosine (see the text). derivative (m2G) in position 10, AG or AA in positions 14 or 15, GG in positions 17 to 21, and AG in positions 21 to 24 of different tRNAs. 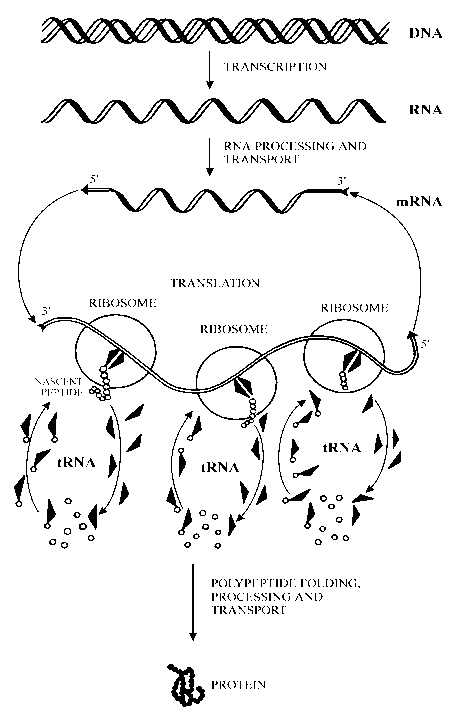 In addition to the four main types of nucleotide residues (i.e. A, G, C, and U), the tRNA polynucleotide chain is characterized by a variety of modified nucleosides frequently referred to as "minor" nucleosides. These nucleosides are the result of post'transcriptional enzymatic modification of the usual nucleotide residues at specific positions of the tRNA polynucleotide chain. Up to now, several dozen various modified nucleosides have been identified. Ribothymidine (5-methyluridine, abbreviated T or m5U) and pseudouridine (5-ribofuranosyl-uracil, Y) are found in nearly all tRNAs and are particularly characteristic of the universal sequence GTYC (Fig. •••). 5,6-Dihydrouridine (D or hU) is also an almost universal minor residue, especially in the region of residues 15 to 24. Bacterial tRNAs typically contain 4-thiouridine (s4U) in position 8. The most common minor residues are various methylated derivatives of the usual nucleosides, such as 1-methylguanosine (m1G), N2 -methy lguano sine (m2G), N2,N2-dimethylguanosine (m22G), 7-methylguanosine (m7G), 2'-0-methylguanosine (Gm), 1-methyladenosine (m1A), 2-methyladenosine (m2A), N6 -methy ladeno sine (m6A), 2'-O-methyladenosine (Am), 3-methylcytidine (m3C), 5 -methy lcytidine (m5C), 2'-O-methylcytidine (Cm), etc.